How do I get my corners to come out even? Hi Terri, Here I have some pictures demonstrating how I sew my rows together to have my corners match up. Here i have all my rows for this quilt sewn together. Here you see that seams from one row to the next, are ironed opposite to the other. In this way they will easily match up when you pin the rows together. Flip the first row onto the next row so you can pin the two rows together. 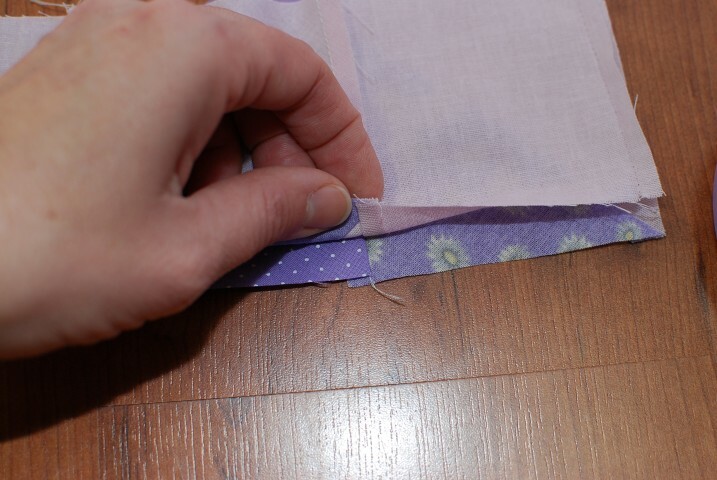 Slide the seams together to match evenly, and even out the bottom raw edge. Then pin together making sure the layers don’t shift as you put the pin in. 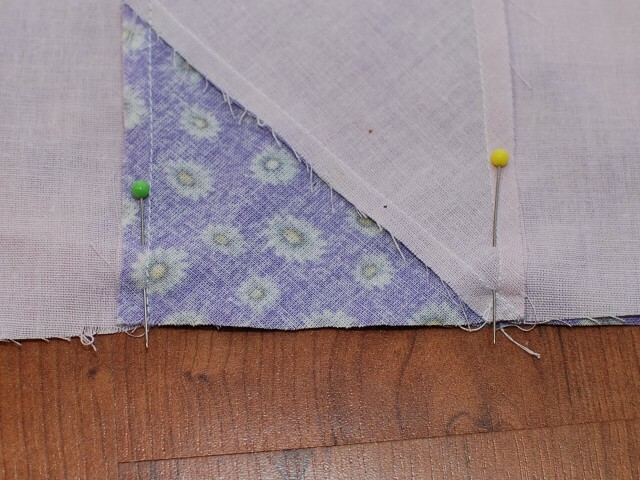 Put the pin in further up, and then come back up about a quarter inch from the bottom, which is pretty much where you are going sew when you sew the two rows together. This is to prevent as little shifting of layers as possible. 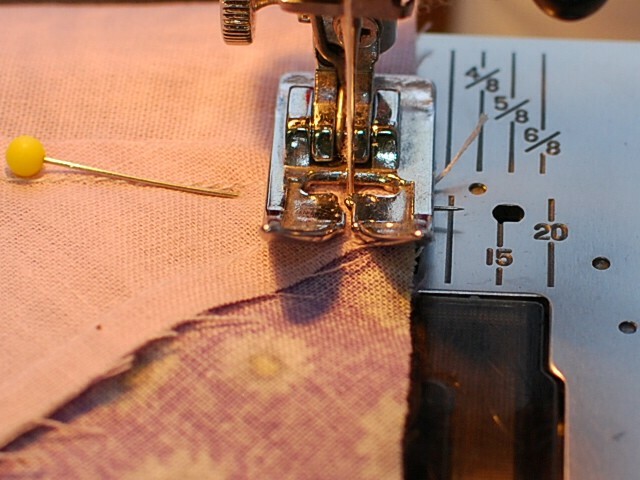 Some like to pin the seams by putting a pin on either side of the seam. You can do this if you like and you feel like it helps. I never do it. I feel it doesn’t really make a difference doing it with one pin or two, so doing one pin is just simpler for me. Sew your rows together. You can go right over the pin if you like, but just be cautious and go over it very slowly, so if you hit the pin, it won’t break your needle. 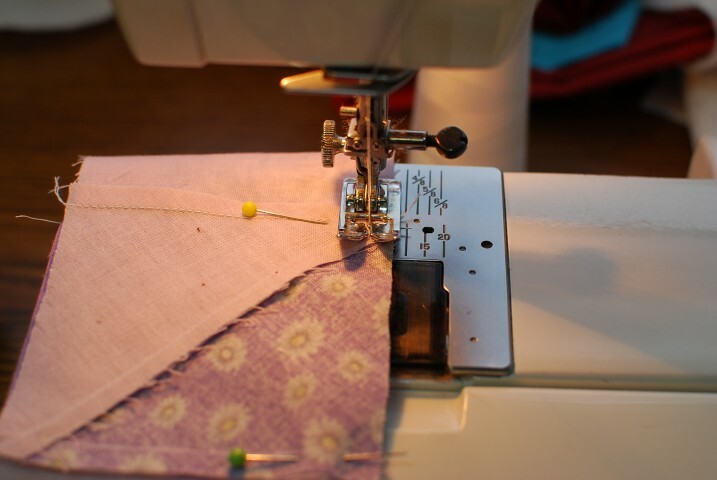 You can even use your side wheel to manually sew over the pin. Then take your pin out, but not before you’ve sewn over the seam, or at least right on top of it. 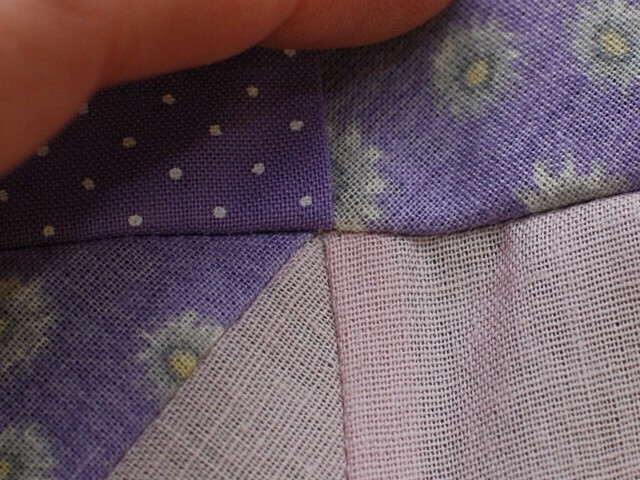 Like I said, you can sew just over the seam before you get to the pin, although the pin should be placed as close to the seam as possible, so there isn’t any chance for layers shifting. 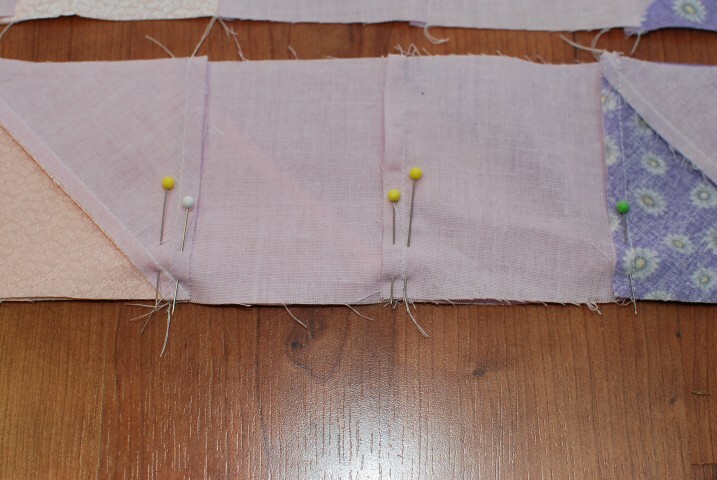 Then you can remove the pin before you sew over it if you are really not sure about sewing right over it. This is about as far off as It usually gets. If you are working with other than 100% cotton fabrics, it could get further off than this. 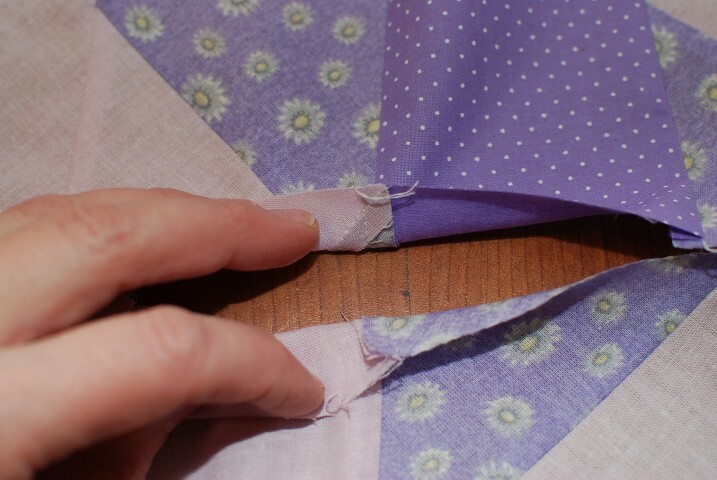 If it does get further off and you are not happy with it, just take out the seams and try again. To me this on is not too far off. It won’t be obvious at all especially after it’s quilted and finished. 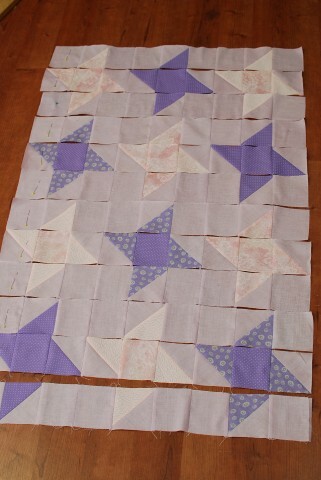 My rows are all sewn together for this baby quilt I’m making for a friend. All it needs now is a border to finish the quilt top. 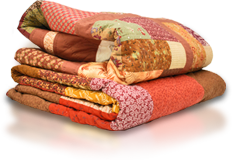 Enjoy quilting and remember, there are no quilting police . This entry was posted in Blog by honeybear. Bookmark the permalink. Wow, great! 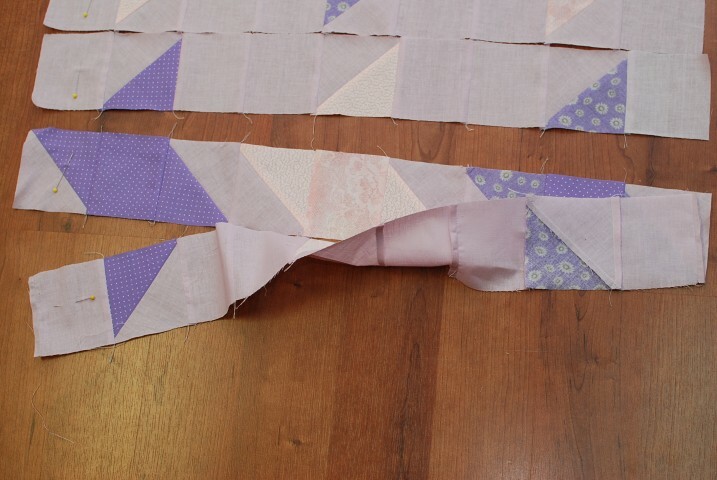 Well, if you stretch your whole quilt out on a frame to hand quilt like I usually do, you have to start at the edge and slowly go towards the center. 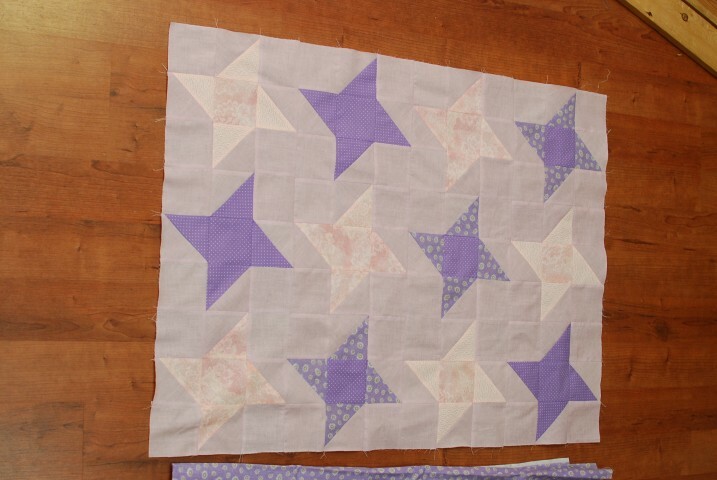 But, if you are just hand quilting in the lap, I would say start from the center, because in that way you can work out wrinkles or gathers etc.. and they will straighten towards the edge of the quilt. If you are machine quilting with designs, I think it would be the same, to start in the center. If you are machine quilting lines, then probably just start on one side and then do all the lines starting on that one side. I hope this helps. Would love to see pictures when you are done!! Wish you all the best.